We are neither a kennel nor a camp but a true home-boarding operation. 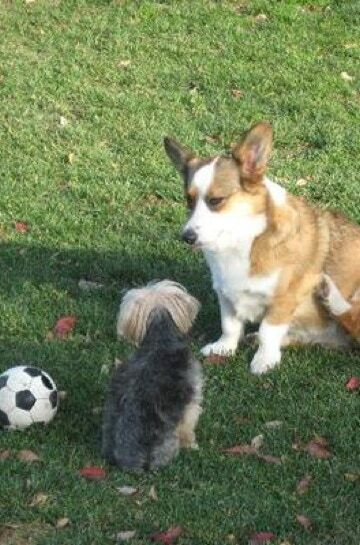 All dogs are screened before staying with us to ensure they are well-socialized and not aggressive. We only accept dogs that have been neutered/spayed and can be reliably off-leash. We are officially licensed as a kennel by the municipal government… but we prefer to think of ourselves as providing true luxury home-boarding to the discerning dog. Our facilities are dedictated to the dogs. There is a wood-stove, bathing/grooming area, stereo system and lots of plush doggie beds and couches for lounging. We have a separate area for meal prep and several private eating stalls. 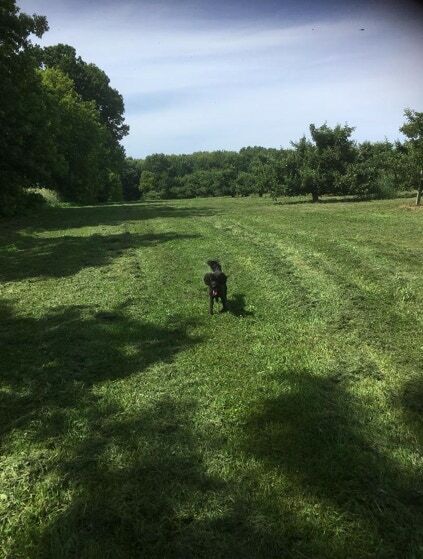 Outside we have a large, fully-fenced, grassy dog yard, two smaller yards and beyond that a huge playground of pasture, farmland and forest trails. We know that it’s pretty rough (ruff?) for your pup to be away from home so we do everything possible to minimize their anxiety. Our aim at dougaldogs is to keep your pup happy and relaxed. We want our guests to feel that this is their home away from home. We pride ourselves on personal attention and interaction. Your dog will not spend his or her time sitting in a kennel and you won&apos;t pay extra for walks. We LOVE the walks! A typical day at dougaldogs will always include as much love as your pup can handle! Our day always starts with breakfast of course! After that we head out on the morning off-leash walk on one of our many trail options. After we return to the yard we might play some frisbee or ball, take a dip in the doggie pool or just relax in the shade and dream of dinner. We do a long afternoon walk and serve dinner later in the day, finally coming inside when it starts to get dark. The dogs settle in for the evening, usually quite pooped (pardon the pun!) from the days activities. Most will curl up in the main room on a comfy dog bed or couch, or get tucked into their own private crate if that is what they are used to. 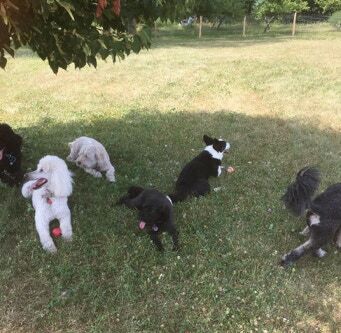 Rachel opened the “Wagaway Walkers” in 2002 to provide home boarding and dog walking services in the prominent areas of Toronto, which she moved to a 50 acre farm in Port Hope, in 2005, and renamed it “dougaldogs”. 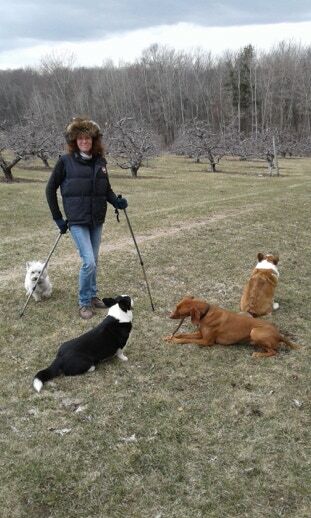 Her current operation near Grafton is highly specialized for a limited number of lucky dogs, which she continues to own and operate for the 16th year. Rachel is an accomplished athlete, a former runner, bicyclist, aerobics instructor, scuba diver (and the list goes on), and she has also operated a personal training business (ACE-certified) and coached powerwalking groups. She is currently working towards a dog training certification, which, as one client put it, is like having your heart surgeon finally going to get her doctors papers! And let’s not forget Rachel’s two Cardigan Welsh Corgis, Georgie Girl and Duncan, who are always happy to see their pals, play with them, and thoroughly enjoy the company of all their guests. Put this all together and you will have some very happy and lucky dogs at the Ultimate Dog Retreat.